Liquid supplement supplying nine free form L-amino acids which provide a stabilising effect. Support for normal, healthy blood glucose levels that are already within a normal range. 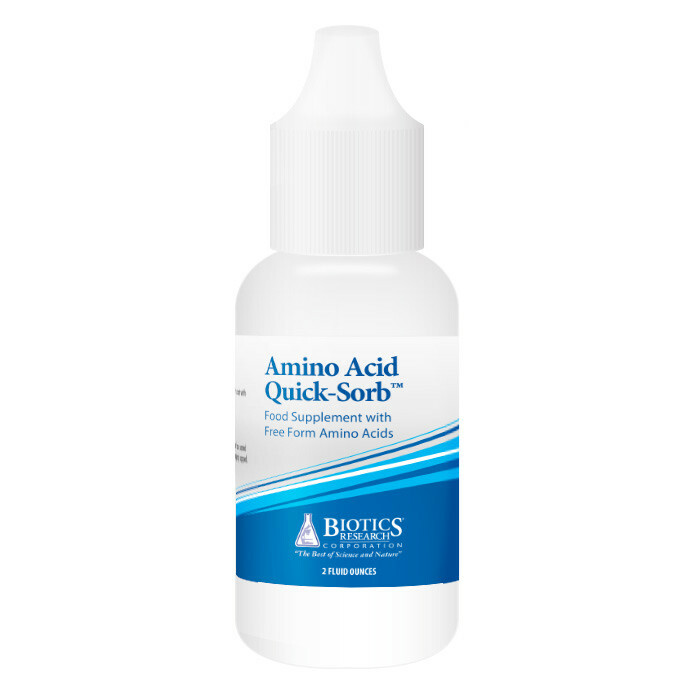 Amino Acid Quick-Sorb contains sublingual free-form amino acids. It is a liquid containing nine free form L-amino acids known, as glycolytic amino acids, in a base of glycerol and water. Why take a liquid amino acid supplement? The speed at which a remedy can help provide energy to the brain is key in certain situations. This remedy can be used for very short term needs such as in endurance sports and reactive hypoglycaemia. These amino acids provide a stabilising effect on blood glucose levels. Many of the patients who need the product, keep it on their person for use when they are driving long distances or in other situations where food is not readily available. When they become fatigued or start to suffer with other symptoms of hypoglycemia, ten or fifteen drops under their tongue will usually relieve the symptoms until they are able to stop and eat. Amino Acid Quick-Sorb can help to increase levels of concentration and revive one fairly rapidly. One experienced practitioner declared that “it is a product that any patient with reactive hypoglycemia should keep with them at all times”. Five (5) drops (approx. 0.16 ml) under the tongue, one (1) to three (3) times each day as a food supplement. Do not exceed the recommended daily dose. Not to be used as a substitute for a varied diet. L-Valine, Potassium Sorbate and Sodium Benzoate.